Boston-based digital agency Imarc nominated for 3 MITX Awards and takes home a win for the “selfie marketing” category. 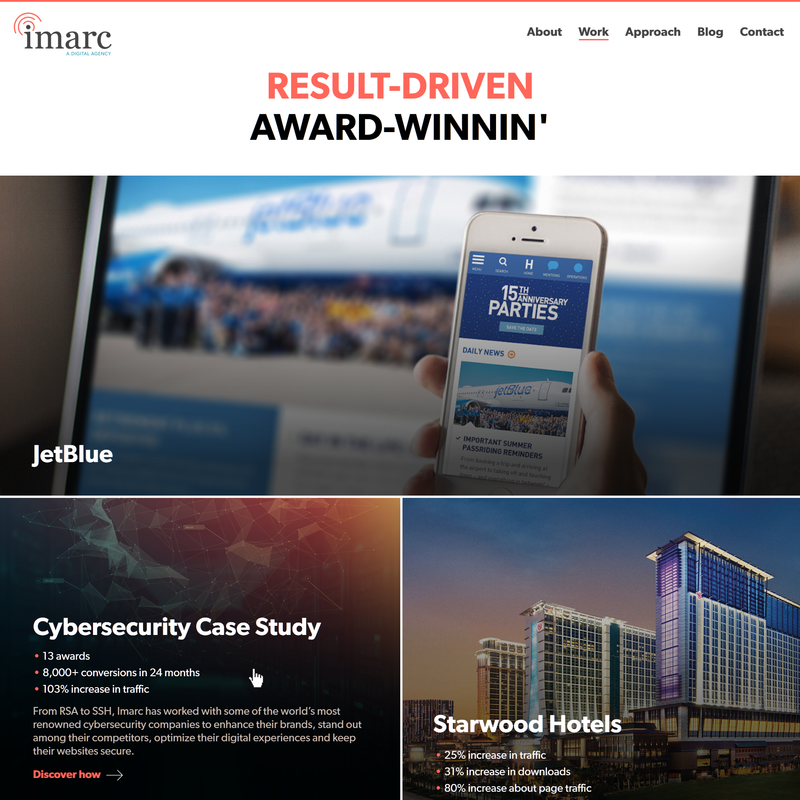 Imarc has been named a winner for the 2016 MITX Awards in recognition for its website redesign of imarc.com, rebrand and internal marketing campaign. The Massachusetts Innovation & Technology Exchange (MITX) Awards celebrate the people and companies creating the most exciting tech, creative and digital marketing innovations in New England. Imarc was named the winner of the 'Selfie Marketing' category, which recognizes innovative self-promotional marketing done in-house. This year, more than 120 senior leaders from Boston businesses judged entries for the 33 MITX award categories. The winning project consisted of a marketing campaign, website redesign and rebrand to support the company’s transition from a “web design shop” to a full-service digital agency, as well as its major expansion in office space, increased in-house staff and additional service offerings. The campaign kicked off by establishing a marketing presence; Imarc generated buzz and demonstrated thought-leadership in the digital space through content marketing, active social media marketing and email campaigns. With a solid marketing foundation in place, the company then launched a redesigned logo, maintaining its same essence, but making it feel more modern, digital, confident and authentic to Imarc. Imarc updated its color palette to reflect its brand personality, transitioned to a new typeface that was bold, modern and clean. Lastly, Imarc translated this all onto our website in a total redesign. It streamlined the site’s IA, incorporated case studies to tell the story of its work, enhanced its approach page to better showcase its services and took a fine-tooth comb throughout to ensure everything from the copywriting, to the structure of each page was optimized to generate leads. “It was a huge undertaking to achieve this all on top of client work, which is what makes this win so exciting. We dedicated ourselves to constant innovation and relentless improvement,” CEO Nick Grant explains.